Knit Mold Collection for Cake Decorating. Marvelous Molds is very proud to introduce our expansive new collection of knit molds for cake decorating. This unique line of molds is the stunning result of a collaboration between Anne Heap (professional cake decorator extraordinaire) and Chef Dominic Palazzolo, the mastermind behind the cutting edge, innovations only found in Marvelous Molds. The results have produced some of the most amazing molds that produce distinctive knit textures that defy reality. Upon reading this you may wonder if we are being a bit dramatic about the performance of these molds, but we want to assure you that you will be pleasantly shocked over what can be created from these extraordinary molds. It would be a wise decision on your part to purchase the molds in this collection but be forewarned! When you use them for the first time, your brain will not be able to immediately accept that what your new mold formed in fondant, gumpaste, modeling chocolate, sugar, Isomalt or chocolate is an edible cake decoration. Instead, your mind will think it is viewing perfectly knitted fabrics made from yarn. You should anticipate that this enjoyable sense of disbelief will be experienced by every one of your friends, relatives and customers who receive a decorated cake from you that has been designed using these fabulous knit molds. 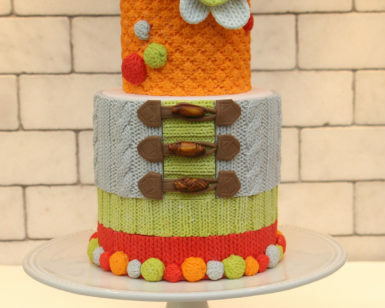 Imagine the thrill you’ll receive when your knit decorated cakes turn the heads of all who see it only to recognize you as a god or goddess of the sugar arts. Only you will know it was simply achieved with this easy to use collection of silicone molds and that makes us very happy since it confirms that Marvelous Molds is accomplishing its mission to make life better for cake decorators. It would truly be a mistake to think that knit is only something your grandmother makes while sitting in a rocking chair grinding out scarves for every member of the family. Instead, you should rightfully recognize that knit is becoming very popular in the fashion industry and can be used in countless ways to convey a myriad of styles that reflect a homey charm or the classic textures of ribbed, cable twisted and braided designs you see on fashion models in magazines and on runways. Once again, Marvelous Molds would like to point out that the results you will experience from these molds will be unbelievable even though we have taken this opportunity to prepare you for it. The truth of the matter is, there is no one on this planet who can capture the delicate details of this fiber art better than Chef Dominic. Every pattern captured in this fondant mold collection was first made by a master knitter using specific yarns that were selected after intensive testing to assure only the best detail reproduction for decorated cakes. Chef Dominic then petrified these knit masters using a secret process he invented in order to capture every thread, weave and undulation that this woven cloth could give. You may be wondering how to use this new line of knit cake decorating molds in a way that captures such a wide range of applications and our advice is to relax in the knowledge that the extraordinary creativity of Anne Heap’s creations, featured throughout this category, will show you how to achieve the full potential this amazing line of silicone molds can offer.